Cedar trees are considered an invasive species in many areas. They spread and grow quickly, stealing water from other plants and shading and killing many grasses at the same time. Cedar trees are not particularly difficult to cut down with a chain saw, but once cut the stump must be ground out completely or new suckers will quickly sprout, often causing just as many--if not more--problems than the parent tree. Remove low branches with a chainsaw if necessary. Many cedar trees grow an abundance of low branches which make it difficult to get access to the tree's trunk. Wear gloves, eye protection and ear protection whenever using a chainsaw. Determine the approximate height of the tree so you can judge whether or not the tree will hit buildings or power lines when it falls. To judge the height of a tree, cut a branch or other piece of wood the length of your arm. Hold the wood at arm's length perpendicular to the ground and back away from the tree until the wood covers your vision of the tree. The distance from you to the base of the tree is the tree's height. Notch the tree with your chainsaw on the side where you want the tree to fall. Start your notch by making a horizontal cut straight into the trunk of the tree approximately half way through the tree. Make this cut on the side of the tree in the direction you want the tree to fall. Make a second cut with your chainsaw starting above your first cut and angled downward at approximately a 45 degree angle so that the second cut meets your first cut approximately half way through the tree. Remove the piece of wood you have just cut out to reveal a notch. The notch needs to be aimed in the direction you want the tree to fall. Plan your escape routes. The tree should fall in the direction of the notch you have just made, but mistakes can happen so before proceeding, plan where you will run based on the direction the tree begins to fall. Do not run in the direction opposite the fall of the tree, but at approximately a 45 degree angle to the direction of the fall. Make your final cut with the chainsaw. Make a horizontal cut on the opposite side of the tree from the notch, aiming your cut approximately 2 inches above the the "V" of the notch. Before the cut reaches the notch the tree should begin to fall in the direction of the notch. As the tree begins to fall, move away from the area using your pre-planned escape route. Cut the tree into manageable pieces with your chainsaw and cut the stump flush with the ground. Use a stump grinder (available for rent at most home improvement centers) to grind the stump down entirely to the roots. Remove as much of the stump as possible as cedars can regrow from a stump. Pour at least 1 lb. of salt into the stump hole to insure that the stump and roots are killed. When determining a safe direction for your cedar tree to fall, take into account the width of its branches as well as its height. Cedar wood can be valuable. 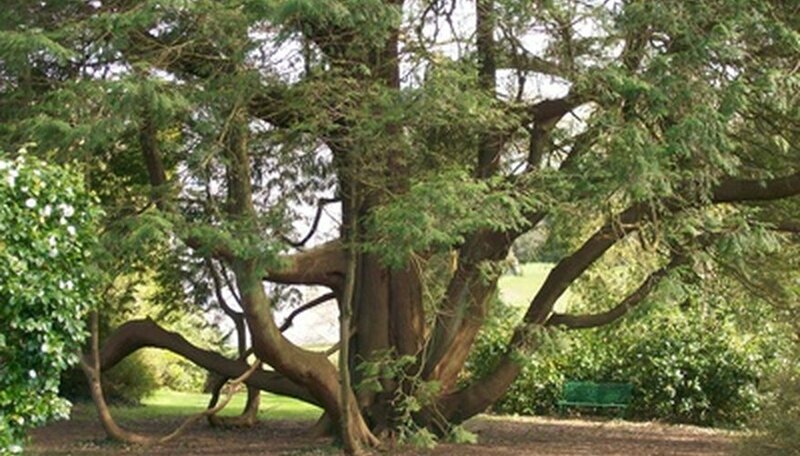 Large cedar trees can possibly be sold to local contractors or builders.